Way back in the beginning when there were just two people in the whole world… and really, how much damage can just two people do? But they did. “When the woman saw that the tree was good for food and to be desired to make one wise, she took of its fruit and ate…” She knew better because Adam had told her not to eat of the fruit from this ONE tree for on the day that you eat of it you shall surely die. She recited the LAW of GOD to the serpent like we recite the 10 Commandments and the Nicene Creed. But she listened to that cunning serpent and his word got into her through her ears and an unholy thing was conceived in her and Eve gave birth to SIN and DEATH and every vice none to mankind that comes in-between those two. But he did NOTHING and his NOTHING cost the whole human race its home in paradise. But our attention is not directed so much to the WOMAN as it is to the MAN – her husband. THIS woman will be everything that THAT woman should have been but wasn’t. But what about THIS man? Will he be the HUSBAND that man failed to be? We’re not given any of the little details about how Joseph and Mary met and what they’re first date was like and what was their most embarrassing moment, and how Joseph finally popped the question…, the kind of stuff that if it were People Magazine, we would certainly have been told, even if never got to the part about FROM THE HOLY SPIRIT. The important thing to know here is that Mary was BETROTHED to Joseph. Which is something like our ‘engagement,’ but not quite. The Jewish practice of BETROTHAL was much more serious and more binding than our ‘engagement.’ The woman continued to live at home and the marriage was not consummated until the wedding. But even while they are still BETROTHED, they are already referred to as HUSBAND AND WIFE. And if either wanted to break off the BETHROTHAL, a certificate of divorce was required. Matthew begins his account where Luke leaves off. Luke tells us that after Mary was WITH CHILD BY THE HOLY SPIRIT, she rushed off to visit cousin Elizabeth, probably to confirm that the word of the angel was actually true. Matthew picks it up THREE MONTHS LATER when she returns to Nazareth and she’s beginning her 2nd trimester, which means that she’s beginning to show. After being separated for three months, Joseph and Mary would have embraced, and as Matthew delicately describes it, “she was found to be with child.” But then quickly adds, “by the Holy Spirit.” No hanky panky here Joseph. •	Mary trying to explain to Joseph about the visitation of an angel, (oh, yea, right Mary. Angels? Really? Is that the best you can do). •	Mary trying to explain to Joseph that child in her was conceived by the Holy Spirit. (Mary really, what do you take me for? I’m a religious guy, but I’m not crazy). Joseph had every right to break it off with Mary AND he had every right to publicly humiliate her for being unfaithful. He was within his rights to make an example out of her, and I’m sure that the other BETROTHED men in the village were encouraging him to do just that so that their wives didn’t get any ideas. “And her husband Joseph, being a just man and unwilling to put her to shame, resolved to divorce her quietly.” Which is to say, he decided to ditch her ‘NICELY.’ And once again, the MAN will be the coward and the wimp and fail to do RIGHT thing. It’s right at this point when every man in the room is slinking down in the pew because he knows what’s coming next. And every woman in the room is thinking the same thought. “I told you. You should have listened to me.” Or at least that’s the way it would have read in People. “Joseph, I know that this is hard to grasp and even harder to accept, but things are not as they seem. There’s no adultery here. Mary is innocent. God is the child’s father and the child is both the Son of God AND the son of Mary. And Mary is the mother of Jesus AND the mother of God. How hard was must it have been for Joseph to wrap his head around this? About as hard as it is for us. The God who fills the universe with His being is a tiny fetus contained within the cramped quarters of a woman’s womb. God, who is spirit and who rules over the whole creation, takes on human flesh and bones and blood and is ruled over by His mother and is TOTALLY DEPENDANT on Joseph to DO THE RIGHT THING. For the second time, we are reminded that the child is conceived by the Holy Spirit. “…for that which is conceived in her is from the Holy Spirit. “Conceived by the Holy Spirit, born of the virgin Mary” we remind ourselves over and over again. “Naming” something or someone is significant. To give something its name is to have dominion and authority over it. Adam even names his wife. “She shall be called Ishah , for she was taken out of Ish.” (Gen.2:23). When Adam names His wife, He gives her his own name. But here, neither father nor mother will have DOMINION over this child to be born. In fact, the child to be born will have DOMINION over them. “And a little child shall lead them.” And so they do not get to name him. There in the Garden where sin was conceived through a woman, God promised that a Savior would be conceived through a woman. Not a MAN AND A WOMAN. Not “between your offspring and THEIRS…” But HER’S. And He shall be called “Immanuel,” which is translated, “God with us.” “God with us” just like God was with Adam and Eve in the Garden of Eden in the beginning. 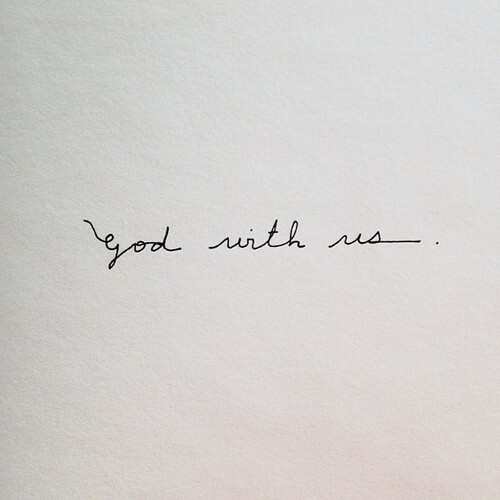 “God with us” now, in this hostile place that we have created by our sin. •	“Immanuel,” who has become flesh of our flesh and bone of our bone and BETROTHED Himself to us. •	“Immanuel” who has taken us to be His bride in the matrimonial rite of holy baptism, where He has given us His Name. •	“Immanuel” who brings His bride to live with Him in Paradise forever.